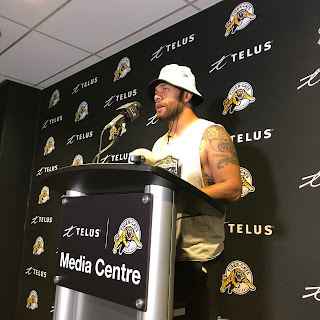 HAMILTON - It's been an impressive start to the season for Jeremiah Masoli. The veteran quarterback will chase a record 10th straight 300-yard passing performance Thursday night when the Hamilton Tiger-Cats (2-2) host the Saskatchewan Roughriders (2-2). Masoli is currently tied with Sam Etcheverry and former Ticats coach/GM Kent Austin for the league mark. Masoli, 29, enters this week's action second overall in CFL passing (1,378 yards) and having registered four straight 300-yard contests. On Thursday he'll attempt to become just the fifth player in league history to start a campaign with five consecutive 300-yard performances. "That's what our mindset is, trying to win games and execute the plays that are called,'' Masoli said. "You always want to have a balanced attack, for sure. Both teams are coming off a bye week following Saskatchewan's 18-13 home win over Hamilton on July 5. Masoli was 23-of-45 passing in that contest for 333 yards with an interception while rushing for a team-high 60 yards on five carries. "There were some easy reads on my part that I need to bring more attention to when I'm preparing and detailing,'' Masoli said of the last meeting. "Obviously they did some different stuff that kind of caught me off guard but for me it's just executing my plays and going through my progressions and making sure my eyes and feet are right. Hamilton receiver Brandon Banks is also looking to continue his streak of three straight 100-yard efforts. He said while wins are a priority for the Ticats, keeping Masoli's string going is advantageous for the offence. Hamilton's offence leads the CFL in net yards (447.5 per game), passing yards (344.5) and average yards per play (7.6). Those are all heady numbers considering none of the Ticats' 54 offensive possessions this year have started on their opponent's side of the field. In fact, Hamilton's average drive start has been at its own 27-yard line, worst in the CFL. Brandon Bridge of Mississauga, Ont., will make his third straight start for Saskatchewan. The six-foot-five, 230-pound Canadian has registered two wins as a CFL starter, both coming against Hamilton. That included the last meeting in Regina, where he rallied the Riders from a 13-12 fourth-quarter deficit. Bridge marched Saskatchewan 77 yards on five plays - going 3-of-3 passing for 43 yards - for the deciding TD. Bridge was 11-of-13 passing in the contest for 101 yards as he again shared quarterback duties with Dave Watford. "They're two different players,'' said Hamilton linebacker Simoni Lawrence. "Bridge wants to throw the ball first, I feel like. This will mark the first time in Hamilton club history it's opened a season with five straight games versus West Division teams. The Ticats will host the Ottawa Redblacks on July 28. "We've got to get the West and do what we have to do,'' Lawrence said. "Next weekend against Ottawa, those are four-point swings. KEY MATCHUP - Ticats QB Jeremiah Masoli vs Riders DE Charleston Hughes. Masoli is the man who makes Hamilton's offence go. He can throw the ball downfield but also has the mobility to either buy time for his receivers or take off upfield. Hughes leads the CFL in sacks with five and has downed the quarterback in three of Saskatchewan's four games this season. THE BIG NUMBER - Four. Saskatchewan has beat Hamilton the last four times the clubs have met. WHO'S HOT - Masoli has registered a record-tying nine straight 300-yard passing games dating back to last season. Banks has been a favourite target over that span and could become an even more important figure for Hamilton on Thursday night with veteran slotback Luke Tasker a game-time decision. Saskatchewan running back Marcus Thigpen ran for 48 yards on five carries the last time these two teams met, his 34-yard TD run giving the Riders their winning margin. WHO'S NOT - Saskatchewan receiver Naaman Roosevelt, a 1,000-yard performer the last two seasons, has 14 catches for 166 yards and two TDs thus far.